Emotional contagion refers to the tendency to automatically mimic and synchronize expressions, vocalisations, postures and movements with those of another person’s and consequently to converge emotionally. 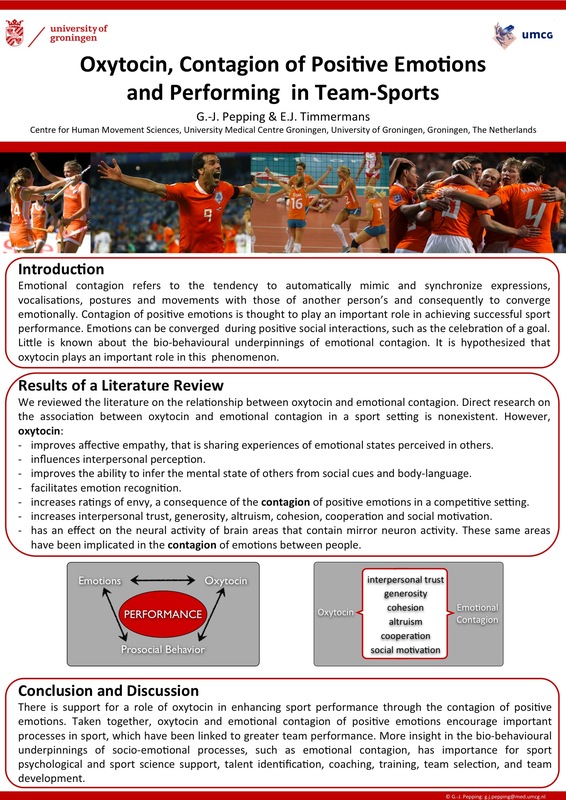 Contagion of positive emotions is thought to play an important role in achieving successful sport performance. Emotions can be converged during positive social interactions, such as the celebration of a goal. Little is known about the bio-behavioural underpinnings of emotional contagion. In this poster we hypothesized that oxytocin plays an important role in this phenomenon. improves affective empathy, that is sharing experiences of emotional states perceived in others. improves the ability to infer the mental state of others from social cues and body-language. increases ratings of envy, a consequence of the contagion of positive emotions in a competitive setting. increases interpersonal trust, generosity, altruism, cohesion, cooperation and social motivation. has an effect on the neural activity of brain areas that contain mirror neuron activity. These same areas have been implicated in the contagion of emotions between people. There is support for a role of oxytocin in enhancing sport performance through the contagion of positive emotions. Taken together, oxytocin and emotional contagion of positive emotions encourage important processes in sport, which have been linked to greater team performance. More insight in the bio-behavioural underpinnings of socio-emotional processes, such as emotional contagion, has importance for sport psychological and sport science support, talent identification, coaching, training, team selection, and team development. We are happy to receive future posters or presentations and upload them for you. Of course you are also free to deposit the future posters/slides yourself!